Sonic Boom has become one of the preeminent late-season festival concerts in the USA and LB returned to Southern Regional Airport in Janesville WI to cover it again this year. The 2017 lineup included Rise Against, Stone Sour, Five Finger Death Punch, Mastodon, The Pretty Reckless, Halestorm, Gojira, Falling In Reverse, Thrice, All That Remains, Theory of A Deadman, Beartooth, Steel Panther, Of Mice & Men, Sleeping with Sirens, Starset, Nothing More, Radkey, Bleeker, Fozzy, Greta Van Fleet, Badflower, As Lions, Ded, Through Fire, Bobaflex, Wayland, Versus Me and Breech. Lou was onstage as host, backstage interviewing artists and in the photo pit. 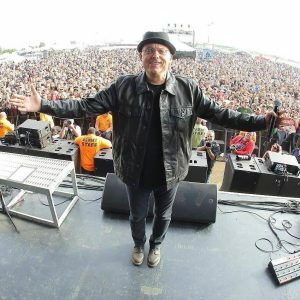 Thanks to the crew at WJJO for bringing him in again this year for the shindig. Thanks also to legendary music photographer Harry Reese for capturing images of LB doing his thing. Rock Fest WI returns for 2016 and Brutus will be back to host! The festival goes from July 14 thru July 16 and is again in Cadott, WI. 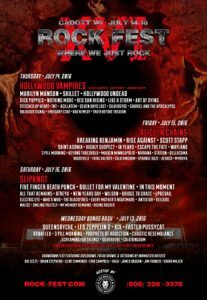 The three-day festival this year features Slipknot, Alice In Chains, Hollywood Vampires, Five Finger Death Punch, Marilyn Manson, Breaking Benjamin, Rise Against, Bullet for My Valentine, Skillet, All That Remains, Scott Stapp, In This Moment, Sick Puppies, Highly Suspect, Saint Asonia, Nothing More, Red Sun Rising, Like A Storm, Stitched Up Heart, Art of Dying, Wilson, Wayland, and a ton of others. It’s LB’s third time as host. Along with his duties as emcee, he’ll also be interviewing and photographing. Special Edition Brutus merchandise by Dirtbag Clothing will be available exclusively at the festival. Get info and tickets at Rock-Fest.com.